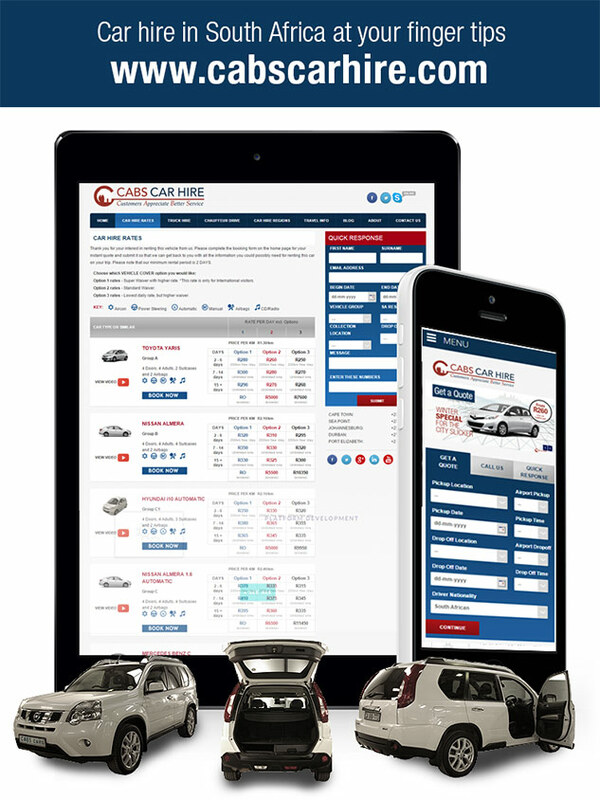 Cabscarhire.com is now available on tablet and mobile for all your car hire bookings. From our rates page you have a choice of groups of vehicles from simple quick business trip Toyota Yaris or Mercedes Benz, an event trip with a team of people can make use of the Toyota Quantum 14 seater, A family holiday usually use the Nissan Grand Livina, for the visitor that is going into the country we have the Toyota Fortuner SUV or Nissan X trail and of course the Hyundai i10 for the city visit. There is of course the Chauffeur Drive service we offer which is more organised than taking a taxicab. A variety of benefits are cited for using chauffeurs, including convenience, productivity, time savings, and driving safety for those corporate business people, events leisure groups or just simple holiday makers that could make use of the Chauffeur Drive service for their entire holiday period. Imagine being driven through South Africa on an itinerary that’s being drawn up just for your preferred sightseeing tour. So if you planning a trip? Check out the site from you mobile, tablet or Laptop and book the car for you next trip. Cabs Car Hire knows customers appreciate better service.